Found beside Great Britain (but, unlike Northern Ireland, not a part of the United Kingdom – never forget this lest you inadvertently cause offense to a local! ), the Republic of Ireland is a diverse and thriving country surrounded by the Atlantic Ocean. Ireland is an ancient country, with habitation noted as far back as 10,500 BC. Many historical monuments and breathtaking samples of architecture from the nation’s past still stand to this day, making Ireland a hugely popular tourist destination, but do not make the mistake of thinking that this is a country that still lives and dies from its past – Ireland has grown to become one of the most prominent and important country’s in modern Europe, with the capital city of Dublin in particular now a thriving business hub that hosts HQs for a many giant technology companies. Ireland has a great many cultural traditions that surround the nation’s heritage, including traditional folk music and dance, in addition to a proud literary tradition – the country has spawned a variety of legendary authors and poets. It’s a hugely social country, with pubs providing the background for most interactions, and the locals will never need much of an excuse to get together and celebrate! Ex-pats will be made very welcome in Ireland, and the country shares a great relationship with the United States so you will not encounter too much of a culture shock if you decide to move; work is also plentiful, especially in major cities such as Dublin and Cork, ensuring that a move to Ireland can be a great move for any career. 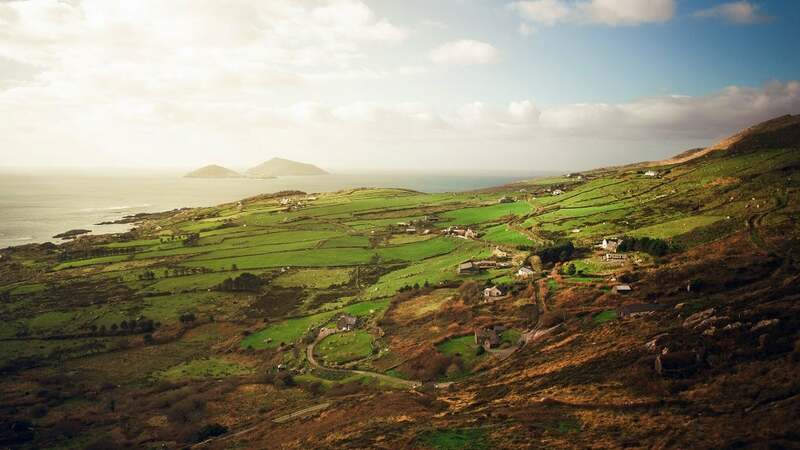 You won’t need to learn the native Irish language, known as Irish Gaelic, to communicate with the locals in most locations in Ireland – English dominates the way people communicate, as well as road signs. Many different regions have their own dialects and slang terms though, so you may need to brush up on the some of the lingo. The weather, however, may need a period of adjustment; if you are used to constant sunshine, you may be left slightly baffled by the ever-changing conditions or Ireland, which can often cover four seasons in a single day. Snow is irregular, but rain is a fairly common occurrence. Dublin, the capital city and one of the most vibrant and lively cities in Europe. Work and entertainment are plentiful in Ireland, with a great many major businesses setting up home in the city, but be aware that the cost of living is also by far the highest in the entire country. Cork, aka ‘The Rebel City’ and a location that the locals refer to as ‘the real capital of Ireland’. Cork is steeped in a rich history, but also enjoys a hugely promising present and future; the city has a thriving economy and bags of culture. Limerick, which is rich in history and glorious architecture that makes it a hugely popular destination with tourists. Tread a little more carefully with considering Limerick as a destination if you do not already have a job offer, however, as the city took a major hit following the 2008 economic crash and the job market is still recovering. Galway, one of the most traditionally Irish regions in the country – here you’ll find a great many of the locals still use the Irish Gaelic dialect (though English remains the dominant language), and traditional Irish culture pervades everything in the city. Waterford, the oldest city in Ireland and formerly a hugely popular and busy trading port. Recently, however, Waterford has fallen on hard economic times, with many businesses closing their doors. You won’t need a Visa to enter Ireland initially, though such an arrangement will only last for up to ninety days – and you won’t be able to work for the duration of this stay. If you’re like to test the lay of the land and spend twelve months in Ireland working casually and seeking something more permanent, you could take advantage of the Working Holiday Agreement. For anything more prolonged, you’ll need an employment permit (see below), which will allow you to live and work in the country for a prolonged period. Once you have spent five consecutive years in Ireland, you will be eligible for citizenship – a process known as Naturalization in the country. If you are looking to work in Ireland, there are two major Employment Permits available to you. If you have a job offer on the table that satisfies the Labor Market Needs Test of the Irish authorities, and a salary in excess of €30,000, you will eligible to apply for a General Employment Permit. These vary in length, and will probably be tied into the particular job that brought you into Ireland – terminating your relationship with your employer may invalidate your work permit. If that job that brings you to the Emerald Isle pays in excess of €60,000, you will not have to satisfy the Labor Needs Test as your position will automatically qualify you for a Critical Skills Employment Permit (unless the job is considered illegible). The same may also apply for certain roles that pay less but the country is in dire need of. Before attempting to enter Ireland you should ensure that you are up to date with all generic vaccinations offered by your physician – Ireland does not have particular requirements, but you may be denied access if you are not vaccinated against traditional contagious diseases. It’s also advisable to ensure that you have an annual flu shot. How much your move will cost you will depend on how you decide to bring your possessions into the country – if you’re in a hurry, you’ll obviously have to use an air courier service. If you can wait, however, it will be far more cost-effective to ship by sea – Ireland has many port cities. As we have suggested, if at all possible look into shipping your furniture, clothing and other substantial possessions by sea; major cities such as Dublin, Cork and Limerick all have busy ports located close to the city. Don’t feel the need to ship everything you own if you hoping to make your stay permanent, though; there are no shortage of shopping options available in Ireland. The cost of living in Ireland varies depending on which part of the country you are basing yourself in. Dublin, for example, is very expensive in terms of apartment rents and entertainment, but the trade-off is you are more likely to find the highest-paid jobs in the capital city. Cork, however, may be worth looking into with serious interest – there is still plenty of work to be found, and general life expenses are considerably lower. Groceries are generally affordable anywhere in Ireland (though, as before, some cities will be costlier than others). One thing that should be remembered, however, is that imported produce will drive up the prices of your grocery bills, so try to shop local. This will endear you to the locals, and provide delicious and wholesome food – agriculture is a substantial industry in Ireland, and you’ll be assured of freshness. The good news is that you’ll be able to convert your American drivers license into an Irish equivalent without retaking any tests or lessons. You may need some practice to grow used to the layout of Irish roads, however; not only do the citizens of the country drive on the left, but the roads themselves may be considerably windier and more weather-damaged that you are used to from the States! A car is not necessarily essential if you are living in a city center especially Dublin, as the public transport options in Ireland are plentiful and reasonably priced. The further into the rural areas of the country that you go, however, the less likely you are to find a regular train or bus service. Also don’t forget that Ireland has many ports, making sea travel a possibility – and in the form or Dublin, Cork and Shannon, the country is served by three major airports. As we have established, accommodation in Dublin can be very costly in comparison to the rest of the country, and is rising all the time (though thankfully not quite as high as other major cities such as London or New York). For comparison, a three-bedroom city center apartment in Dublin would likely cost around €2,500 per month (circa $3,000) to rent – that’s a little higher than the average monthly salary on rent alone. Look for a property of equivalent size in Cork, however, and you’ll save around a thousand euro’s per month, without much of a drop in salary. Ireland is home to a number of reputable universities that welcome international students – and as an American, you won’t need a Visa to study in the country. You will, however, need to register with the local Gardaí upon your arrival, and provide proof that you have been enrolled into a full-time course, and pay for at least one term in advance; you may also be asked by the university to prove that you can afford to support yourself economically throughout your studies, both in terms of tuition and general life expenses. You’ll also be permitted to work for up to 20 hours per week while studying to supplement your income. Trinity College Dublin, which features in the top 100 establishments in the world. University College Dublin, which includes the legendary writer James Joyce among its alumni. The National University of Ireland in Galway, which is steadily increasing in popularity and offers less traditional courses than some other universities. University College Cork, which sets a new standard for environmental sustainability. Dublin City University, which is a new building having only been established in 1975, but is steadily building a firm and positive reputation. Public healthcare, funded by taxpayers, is available to anybody that has lived in Ireland for over one year – you’ll need private healthcare insurance for the first twelve months of your visit, and this will probably be a condition of having any Visa accepted. However, if you can afford it, many people would recommend retaining your private healthcare policy once you have settled in Ireland – while the country has many hospitals and medical services, a popular belief is that the publicly-funded healthcare service is overburdened, leading to long waiting lists for doctor appointments and medical procedures. Find out if your employer will offer a private healthcare policy as part of your contract, as this will be one less to worry about. Do not panic if they do not, however, as Ireland has access to a great many providers of such insurance. Alternatively, you may wish to look into taking out a policy that covers overseas requirements before leaving American soil if this is more cost-effective. However you decide to obtain private healthcare insurance, you may find yourself being glad that you did in the hopefully unlikely event of an accident or falling ill whilst in Ireland. Irish politics are a complicated business, and something that we strongly recommend you brush up on in details before making your move to the country – it’s certainly inadvisable to attempt to engage a local in political discourse before you have a firm understanding of the state of the nation. In short, Ireland is a Republic, with the current President – Michael D. Higgins – holding the post since 2011 – his term will expire in 2018, as an Irish presidential term runs for seven years. There are two major parties; Fianna Fáil, a Republican party that spend most of the 20th Century in power, and Fine Gael, a slightly more liberal party (they describe themselves as ‘progressive-central’). Several other parties operate out of Ireland, however, including the Labor Party and Sinn Féin, with popularity that fluctuates. You can learn more about Irish politics by clicking here.